Jugs and dry products are usually the most challenging related to chemical mixing. The Mixmate Inductors assist operators and have features that are not available with any other system at any price. An ag chemical mixing system is not complete if it will not handle bulk and package products. The most expensive products usually come in small packages and the Mixmate Inductor offers the highest accuracy for measuring these products. The inductor weighs the products as they are added to the mix. No premeasuring is required. The Mixmate Chemical Inductor is available in two versions. Jug processing with Mixmate is rapid and precise for full and partial containers alike. Partial container measurement is revolutionized because no separate measurement vessel is needed. A vertical bar graph shows on the screen of the Android tablet to prompt the operator to add a product manually. The product name, the target amount, and actual amount are shown. Just add the product and it is measured by weight. We know of no other system that can match Mixmate with jug processing speed, accuracy, and automatic measurement. 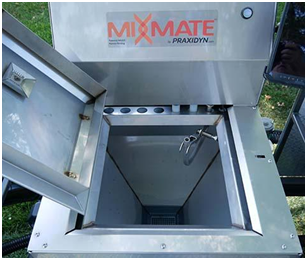 Mixmate drains, measures, reconciles, records, and rinses a jug in about 12 seconds. This process happens very rapidly and it is hard to see everything that is happening in the video. Watch it again and pause the video to see the details. Mixmate uses air, when available, to empty the jugs rapidly. The air also improves rinse activity and keeps rinse water from building up in the jug during rinsing. This process feels fast when using the Mixmate Inductor. When a 2.5-gallon jug is used, the records should show 2.5-gallons. Variations in product density, product remaining in the container, variations of jug fill, and platform movements all contribute to errors in the measurement records. Mixmate reconciles the measurements when a 2.5-gallon jug is used, the recorded measurement is reconciled to 2.5-gallons, and inventory slippage is reduced. The Mixmate Fusion combines the best features of Mixmate in a compact and economical package. The Mixmate Fusion measures by flow for automatic chemical mixing from bulk products and a specially designed plastic inductor which measures by weight all in one compact unit. The small footprint of the Mixmate Fusion saves valuable floor space on spray tender trailers. 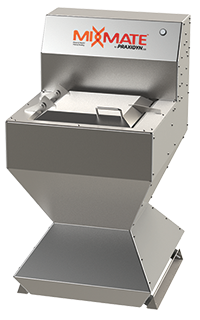 The new plastic inductor has a high flow rate rinsing system for better handling of dry products. The Fusion Inductor has two modes of operation for dry products. A new continuous flow mode is used for whole containers of dry products. A large stream of water flows around the rim of the inductor cone and washes down the sides of the inductor. The computer monitors the weight of the inductor and modulates the drain valve on the bottom of the inductor to hold a small pool of water. Dry products can be poured into this flow of water which is pumped directly to the applicator or batch tank. The inductor does not measure the products in the continuous mode and is normally used for whole containers which are easily counted. Partial containers are measured by the inductor in the second mode. A pool of water is captured in the inductor and the scale measures the dry chemical as it is added. The mixture is then pumped out and the inductor is rinsed. The Fusion has the same patent-pending jug processing system as the original Mixmate to drain, measure, rinse, record, and reconcile the data from a jug in about 12 seconds. Mixmate Fusion gets its name from the combination of the inductor for jugs and dry products and a stack of valves and a flowmeter to measure the bulk products. The new software and electronics automatically route multiple bulk chemical inputs and rinse water through a single flowmeter. This combination lowers the cost of measuring bulk products. Three valves are used for bulk chemicals and a fourth valve is connected to rinse water to flush the manifold and flowmeter. Each bulk chemical is measured in the order listed in the prescription automatically. There are two flowmeter options, a magmeter and a gear type flowmeter. The gear meter is the most commonly used meter since it works across a wide variety of chemicals without the need of recalibration. The magmeter works well with thick water-based chemicals and fertilizers. The scale and flowmeter come precalibrated and no additional calibrations are needed in the field. The Fusion features a stainless steel frame for low maintenance and long life. Fusion is compatible with existing Mixmate components for system expansion through CAN Bus connections. The Mixmate Pro Inductor can have up to 6 input valves for bulk chemicals. Each valve has a corresponding electrical connector to control a 12-volt electric pump. The connectors are powered when a valve for a product is opened. Each product is measured through the inductor by the order in the prescription. A product requiring a large quantity will be measured in multiple fills of the inductor automatically. Measurement by weight in the Mixmate Inductor is one of our highest accuracy options. Rinse water and air input can be seen in the left side of the photo. The fuse and relay blocks are accessible on either side of the electric pump connections. The lower panel of the Mixmate Inductor houses the electrical and output connection of the inductor. 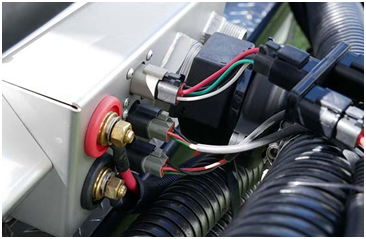 The main 12-volt power lugs supply power to the system. The heavy duty connectors are designed to handle the heavy electrical loads of electric pumps. The 4-pin connector in the top center of the photo is for the external CAN Bus connection. This 4-pin connection supplies power and serial communications to external valves and modules. The two 3-pin connectors are used for external pulse-type flowmeters. These flowmeters are normally used to measure the water or carrier used in the mix. The large 2-inch threaded pipe is the output of the inductor. The small 1-inch pipe is used to supply a venturi under the inductor as an option. Normally a venturi is not recommended. It is easy to measure dry flowable products with the Mixmate Pro Inductor. There is a prefill option. The inductor will measure in a predetermined amount of water and then prompt the operator to add the dry flowable product. The scale in the inductor measures the amount of prefill separately from the amount of dry flowable product. The jug rinse nozzle prefills and rinses the inductor. If more speed is desired, an additional valve can be added to speed up the prefill and to enable the continuous flow option similar to the Fusion Inductor. Multiple bags of dry flowables like AMS can be mixed quickly. The large volume carrier, which is usually water or liquid fertilizer, is normally measured with flowmeters. Mixmate can control the amount of water used in the mix for better accuracy. Mixmate will also hold back a portion of the water so the system and hoses are rinsed at the end of the mix. When the hose is uncoupled from the sprayer, only water remains to protect the operator and prevent unwanted spills. Mixmate Flow can be added to a Mixmate Inductor to give additional speed to a system. This combination gives the system the highest versatility and speed available. 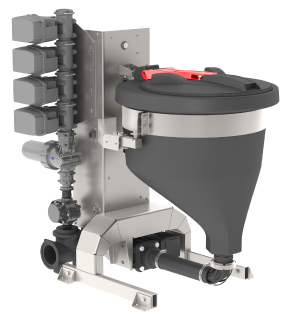 Visit the Mixmate Flow page to learn more about the Flow measurement options. The Mixmate system communicates with the valves and electronic modules with a CAN Bus. A CAN Bus is the common connection between electronic systems in tractors, implements, and vehicles. It is proven and reliable. 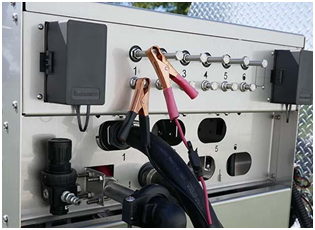 The CAN Bus in our system supplies the power to all of the modules and valves and data communications. The same simple four wires connect the components in the Mixmate system to streamline the wiring. The CAN Bus makes it very easy to modify the system if new features and components are added. The Android tablet communicates with the system through a Wi-Fi wireless connection. This adds great versatility. If manual inputs are not needed, the tablet only needs to be near the Mixmate system to control it. A common example is when the tablet is mounted on the loader in a dry fertilizer mixing plant. Our electronic modules are rugged and designed to be out in the weather. All of the electrical connections are proven to be reliable in the ag industry. The electronics are encapsulated for the highest degree of protection from the elements. The modules are also designed to retrofit existing systems. Our scale module can be connected to an existing scale to log data or be part of an automated system. Most existing pulse-type flowmeters can be connected as well. Digital outputs can be used to control air operated valves or connected to relays to drive high voltage electric motors. The flexibility of the software and the electronics give unmatched versatility to a Mixmate system. The flexibility of the Mixmate hardware and software make it possible to connect to existing equipment. Often it is possible to use existing valves, flowmeters, and scales to be part of a Mixmate system. A mixing tank with a scale can be connected to the Mixmate electronics and software to take advantage of the automated recordkeeping and data connections with the office. The software will still do all of the calculations and conversions for the operator to make the job easier and more accurate. Another example is dry fertilizer mixing with a weigh hopper and a tumble type mixer. The hopper is filled with a loader and since the Android tablet is wireless it can be mounted on the loader. The user interface prompts the operator for each ingredient in the mix and the tablet is easy to see and use right from the driver’s seat. The records are created automatically which improves accuracy and saves time. Success comes in many different ways. Lowering stress during the busy season leads to job satisfaction and better employee retention. Sprayer operators who mix in the field get a mental break when the system automatically does the calculations and records. One operator reported he found a leak while doing an inspection as the sprayer was being loaded. Very often good machine operators may not be the best at recordkeeping. Mixmate helps them be successful through automated records. Operator productivity goes up when the machines and information systems work well. The Mixmate hardware and software have been optimized to give a satisfying user experience. When someone says “I love my job!”, we are glad we could help make the job of mixing chemicals a safe and fun experience. Give us a call, we want to help YOU! Learn the many ways Mixmate can benefit your farm operations. Mixmate was designed for farmers by farmers. “How are we going to measure drys? How are we going to measure small quantities of liquids? I mean, the other systems could measure out of totes, which we do a lot of, but that doesn’t really save anything. To have a system that really works, you have to handle everything. And so we went to Mixmate and asked those questions and you guys had answers.